Travel and paint and read. See the inside of my gym on a regular basis instead of just driving past it occasionally. Interact with my friends in person regularly instead of sporadically texting or emailing them. Watch less mental junk food television programming. Cultivate a green thumb, if it kills me. Have oodles of free time to cook and photograph and write. Remember how to ask where the bathroom is in French. But I doubt I could understand the answer. Could get a nice tax deduction if I just made a donation to the YMCA instead of paying gym dues each month. Kill most plants within a month. Am completely captivated by bad television. Barely get the food I do cook photographed before it gets eaten. And then sometimes I write about it. While all the pieces of my perfect world may never fall into place, because seriously how do you turn away from the train wreck that is Sober House or Celebrity Rehab, I can walk you through one more dish that made it from the plate to the blog. I assure you, devouring a serving of Spiced Chicken won’t make you feel nearly as guilty as an episode of Millionaire Matchmaker. BAH Note: I served this over some steamed frozen cauliflower. I think if I had roasted some fresh cauliflower instead, it would have been phenomenal. When I made it a second time, I roasted a head of fresh cauliflower. And sure enough, it WAS phenomenal. Combine the paprika, coriander, cumin, ground cinnamon, 1/2 teaspoon red pepper flakes, and salt in a small bowl. Once completely combined, rub the spice mixture over the skinned chicken thighs. Meanwhile, heat half of the oil in a large dutch oven over medium heat. Cook half of the chicken until it is browned on both sides, about 5 minutes per side. Remove chicken from the pan and repeat with remaining oil and chicken. Once all the chicken has been browned, reserve 2 tablespoons of drippings and pour off the rest. Cook the diced onion in the reserved drippings for approximately 5 minutes, or until translucent. Add the remaining 1/4 teaspoon red pepper flakes and cinnamon stick and cook for 1 to 2 minutes until fragrant. Add the wine and tomato paste to the pan and stir to loosen any bits on the bottom of the pan. Simmer until the liquid is almost evaporated and then add the broth, diced tomatoes, honey, lemon wedges, and bay leaves. Stir to combine, add the chicken back to the pan. Bring to a boil, cover, reduce heat, and simmer for 20 to 25 minutes until the chicken is cooked through. I’ve got a fantastic recipe for an Indian Rice dish that includes cauliflower. I should dig that out of the binder and make it again since I’m on a cauli kick right now. It also makes an unbelievable substitute for mashed potatoes. Your perfect world/real world list made me laugh. I can so relate. This looks totally like my kind of thing. Especially with the roasted cauliflower. I am on a cauliflower kick too — I just found a recipe for roasted cauliflower done on the grill which looked wonderful and totally inspired me but when I checked the cauliflower at the grocery store last time they looked very sad. Good reminder to check again today though. Oh, and your new kitchen is gorgeous! 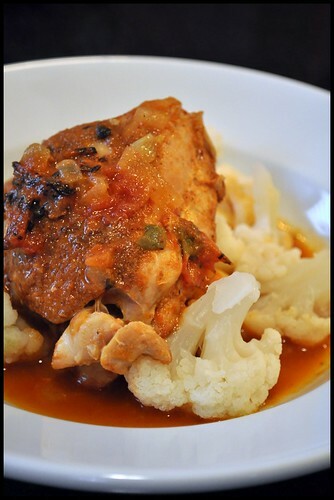 Julie, the roasted cauliflower sends this chicken over the top. Hope you were able to find some happier looking cauli at the store. Two years later and the kitchen is holding up pretty well. But that stove and its stainless “accents” never looked as good as the day it got installed. Note to self, no more stainless accents!